My boyfriend and I at halloween night. lm, I loved 'Challenge Aneka' lol....greeat show, she was such a blagger! New job's going well thanx! I'll post an update soon! Glad you had fun on ya visit, too! Me n mah boy wen we used to attend Rave Parties. Me and Husband before Opeth concert. Pics weren't very clear but i had the feeling i knew you from somewhere! Definitely remember you now! LOL! Hey Jazz Yup! I remember you oh and Congratz!!! on your wedding! WOW You have no clue how jealous I am!! Seconded!! That's fantastic! I didn't know you could buy big ones like that! I didn't know you could buy big ones like that! Yup, there are loads of them.. here is mine (birthday pressie from hubby) and some of the others from that company.. I may get the version 3 if my wife doesn't notice!! Interests:Ancient history, computer web and design, art, vampires, motorbikes, sharks, tigers, reptiles, creative writing, Aerosmith, snowboarding, Tomb Raider, being with friends, PC games and Playstation, celebrations and holidays, films, music, my bed, TV, Liv Tyler, Angelina Jolie, Robin Williams, Johnny Depp, Kate Winslet, Mia Tyler, partying, travelling the world. No way do you have that statue! I'm so jealous! I'm after the new Legend one, although if I did get my hands on one I've no idea where to put it! 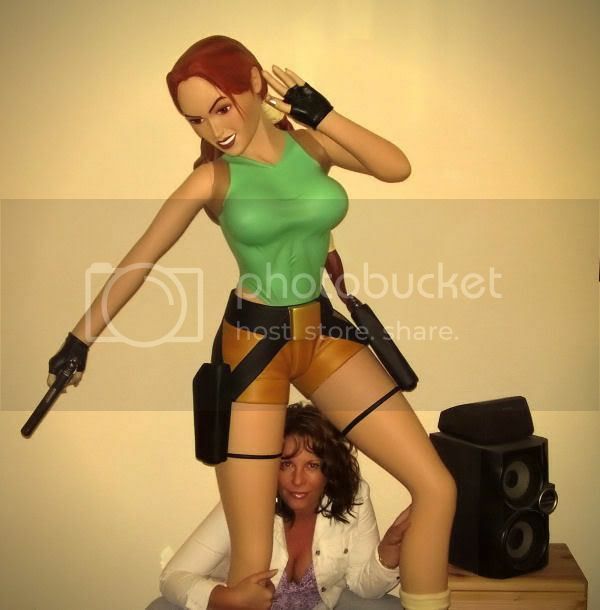 A picture of moi... Lara Croft's sidekick.